Asbestos was widely used in a numerous products throughout the workplace and household. However, exposure to asbestos can lead to asbestosis, lung cancer, and a rare form of cancer called mesothelioma. Though the potential hazards were known by manufacturers and distributors for many years, the use of asbestos as a cheap insulator, fire retardant and bonding agent led to its continued use by corporations until the 1990's. This placed workers who handled asbestos and asbestos containing products in the path of danger. If you have been diagnosed with an asbestos related disease, we must work together to determine the sources of your asbestos exposure. I will undertake the investigation by tracing your work and personal history to determine when and where you or your injured loved one was exposed to asbestos in order to prosecute your claims for compensation. Exposure to the products listed above or working in conditions that involve asbestos fibers can place individuals at risk for asbestos related diseases. 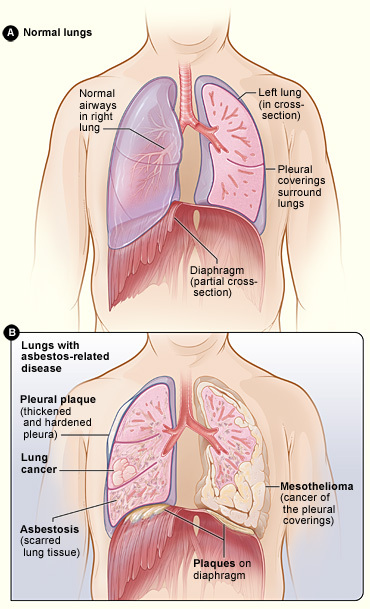 These diseases include asbestosis, lung cancer, and mesothelioma. Asbestosis: What does this diagnosis mean? Asbestosis which is also known as pulmonary fibrosis or scarring of the lung is a lung disease that occurs from breathing in asbestos fibers. When someone breaths in asbestos fibers the internal tissue is scarred preventing the lung from expanding and contracting normally. There exists no cure for asbestosis. Asbestosis is a progressive disease that often necessitates the use of external oxygen at some point. If you have been diagnosed with an asbestos related disease, I will provide you and your family with accurate and important information about your rights and potential claims. If you choose to seek representation with my office, I will be with you step by step throughout the process. You are not alone in your fight against asbestos disease. My personal experience with asbestos litigation has given me the knowledge, passion, and commitment that will be an asset to successfully representing on your behalf. Should you require additional information about asbestos disease or litigation, please do not hesitate to contact my office.